Eating fried food is associated with a higher risk of heart failure, acute myocardial infarction, total ischaemic heart disease and death, a study shows. This is particularly true for fried fish and fried chicken, according to the study, which analysed data from nearly 107,000 postmenopausal women aged 50-79 in the US whose lifestyle and health status were being followed as part of the Women’s Health Initiative. 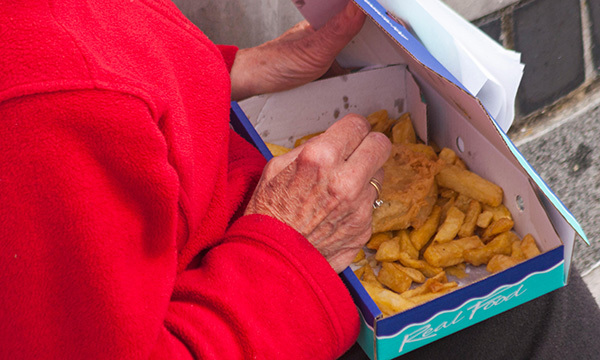 There are several possible explanations for the association between fried food and mortality, the study found. Frying deteriorates oils through the process of oxidation and hydrogenation, leading to a loss of unsaturated fatty acids such as linoleic acid and an increase in the corresponding trans fatty acid. Frying starchy food at high temperatures can produce the harmful chemical acrylamide. Reused cooking fat could inhibit paraoxonase, an enzyme that decreases the activity of low-density lipoprotein (LDL). This results in an increase in LDL and harmful cholesterol. ‘We have identified a risk factor for cardiovascular mortality that is readily modifiable by lifestyle and cooking choices,’ the authors say. Previous studies have found that fried food from North American fast food restaurants is associated with higher mortality, while in the Mediterranean population there is no association between fried food consumption and mortality. Frying practices vary and fast-food restaurants seem particularly unhealthy, as food is usually deep fried in corn oil which is often reused. In the Mediterranean, however, olive oil and sunflower oil are more commonly chosen and the oil is less likely to be reused. Frying modifies the composition of food, often making it less healthy than the same food in its raw state.